As we know that the latest firmware for samsung galaxy is gingerbread. DDLF2 and now there is a latest custom Rom based on this latest version known as The CoD RoM The CoD Rom is based on stock firmware baseband DDLF1 with ICS Trans theme which is used as an extra theme along with Creeds Rom and the Kernel used in this Rom by developer is kuro kernel (a lil bit modified init.rc file to allow system to handle CPU) as because Kuro kernel it is smooth, fast, minimalistic and stable. This Rom is developed by deepakjoshid007 senior member of XDA so thanks him for his work .This Rom doesn't support apps2sd as the kernel doesn't support it you can use Link2SD or you may use kuro script to mount ext partition as "data". 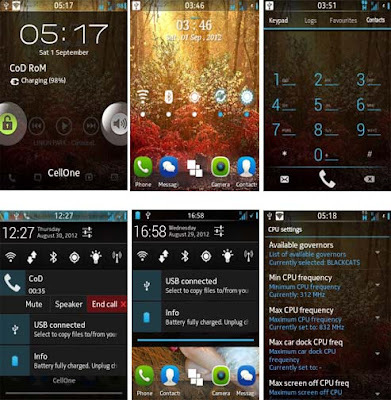 Lets have a look on few Screenshots of galaxy y running on The CoD RoM. Fully transparent UI with JellyBean and ICS feel. Features come from the kernel like governers and frequecy init.d. ICS like Dialer and Phone app. Transparent MMS app with skins , removed auto SMS to MMS conversion and increased recipents limit. Transparent Gtalk, contacts, music app. All google apps already updated and market update compatible. Smooth scrolling through disabled scrolling cache. Added init.d scripts for batter performance ( Thanks to Kurotsugi again). Xperia launcher with settings and already integrated Meego Icon theme. 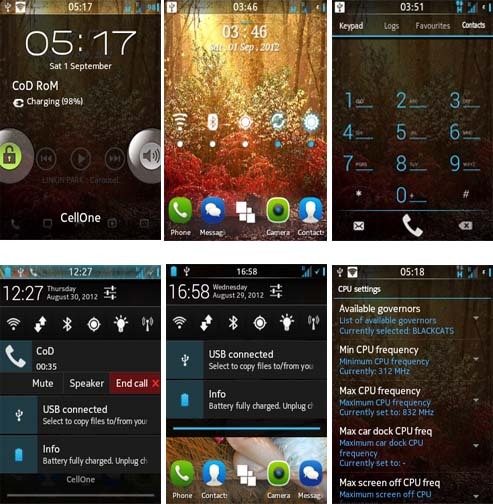 This custom Rom is only meant for Samsung Galaxy y GT-S5360 and not for other devices. Use it at your own risk we will not be held responsible if you brick or damage or whatever happens to your device while following our instructional guide. Backup your system and charge battery full before proceeding. As this Rom is splitted in two parts one is the Rom and other is Google Apps download both CoDRomv1.zip and Gapps.zip from the link above. If you dont have CWM then download it also and put it on the root of your SDcard and turn your phone off. Reboot into recovery mode then flash the cwm zip and get into cwm recovery and backup your current Rom. Now go CWM recovery's advance option and reboot the recovery then wipe data and cache from stock recovery. Flash again CWM recovery and wipe data and cache there also. Wait till it gets installed then wipe data and cache(optional) and reboot. After using your phone for around 15 mins reboot into recovery and flash Gapps.zip and reboot. Congratulation! you have successfully installed The CoD RoM on your Samsung Galaxy y GT-S5360 if you find any bug post on thread page so developer can fix it on next update.